One of Menton's tiny walking streets, just off the main pedestrian street. It's so nice that that Menton has this central area totally free of cars. 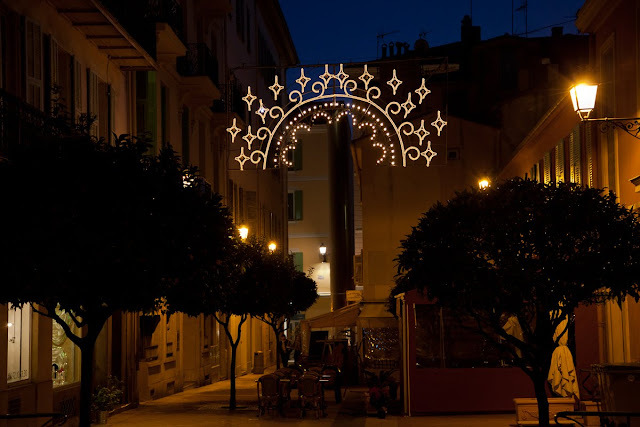 L'une des petites ruelles de Menton, juste à côté de la grande rue piétonne. Il est tellement agréable qu'à Menton, cette partie centrale soit totalement libérée des voitures. I like the warm glow from the street lights. I have been following your blog for ages and feel I really should comment! The light displays are really wonderful. This street is wearing it's 'tiara' Jilly. Beautiful evening in Menton. That tiara shaped light looks like a crown fit for a princess. So nice! I love it, too! Where is this cozy place situated? Looks like a nice place to sit outside!